Pets can be the best friends and the best secret keepers. 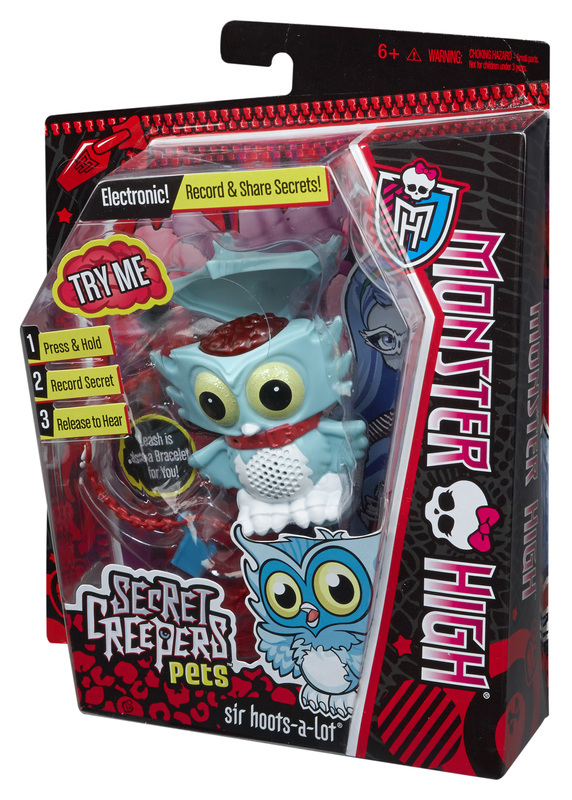 The pets of the core Monster High ghouls have come to unlife to keep your secrets! Sir Hoots a Lot, the scary cute sidekick of Ghoulia Yelps, has a creepy cool secret-keeping feature: pop open its head to reveal a voice-recording brain. With the leash on, use the recording mechanism to store your secret, then “leash” the wise, but not old, owl to keep your secret safe. The creature-specific collar also doubles as a bracelet for the girl, so it's easy to carry and easy to conceal (not to mention spooktacularly stylish). When the creeper's head is open and the leash is in, press its brain to hear the stored secret, or connect its paws to that of another (others sold separately) and press the brain to share. The secret is transferred in animal speak - like a wise hoot - so it can be listened to later in private. Activation is easy, but security high! Transfer secrets between your ghoulfriends while keeping the gossip hounds at bay! Collect them all to expand your secret-keeping capabilities. Ages 6 and older.